The Unimog. Unique and incomparable. The off-road chassis is designed for maximum off-road flexibility when transporting materials or traveling off-road. It is only in the long wheelbase version and because of its specific design does not permit the use of a 3 point hitch on the rear. Decades of experience, the closest kind of cooperation with the people who use such vehicles, and constant contact and the exchange of ideas with the leading body manufacturers – these are the factors which form the basis for the Unimog’s worldwide success over the past 40 years. Mercedes-Benz can provide any customer with a made-to-measure, dependable Unimog – with superior engineering, exemplary in extreme conditions, uncompromising off the road and fast on it. Four-wheel drive, differential locks front and rear, exceptional off-road capability. Features which all Unimog series have in common. The new, light-weight Unimog U 100 L Turbo is the most compact and agile in the range, with an engine output of 90 kW (122 hp). The new U 140 L medium series Unimog is available with GVWs of up to 8.5 tonnes and engine outputs of up to 100 kW (136hp). Among the vehicles with high off-road capability, the range of powerful Unimogs from the U 1450 L to the U 2450 L are gaining in importance on the market. This series was specially developed and designed for applications requiring a large amount of power. Depending on the model, engines with outputs of 100 kW (136 hp) up to 177 kW (240hp), and GVWs of 7.5 tonnes to 14 tonnes are available. With the portal design of the axles, the axle tube and the differential are both above the centre axis of the wheel. The result is an extremely high ground clearance yet a low centre of gravity. Obstacles up to half a metre high can be overcome by the Unimog without difficulty. In addition, the drive-train components are subjected to less strain because the full driving torque is reached only at the wheel itself. Both axles are of identical design and strength. This suspension, unusual on a commercial vehicle, enables all four wheels to maintain constant contact with the ground in rough terrain. It also ensures high ride comfort during on-road operation. The differential locks in the front and rear axles can also be engaged pneumatically on the move. The 100% locking, wear-free dog-type clutches ensure that the Unimog can cope with even the most difficult situations as long as just one wheel has enough traction. The Unimog is designed as a single-tired vehicle. This makes it easier for it to take rough ground in its stride. Because the rear wheels follow the track of the front wheels, rolling resistance is lower and traction is higher. Reducing the pressure in the tires prevents it from sinking into the soft ground and raises traction even further, stopping the Unimog from getting “bogged down”. With the tyre inflation system (a standard feature), tyre pressure can be adapted to conditions on the spot. Where above-average off-road performance is required, the Unimog leads! The flexible ladder-type frame consists of two U-section side members with welded-in tubular cross-members. This provides sufficient stiffness on the road as well as excellent torsional flexibility during off-road operation. The drive-train components are located in such a way that negotiating high ramps and bumps in the ground is without risk. The low center of gravity of the vehicle and its attachments ensures a wide safety margin during off-road operation. Short frame overhands, portal axles and large tires prevent the Unimog from touching the ground on steep slopes. Steep banks, hills and obstacles are no problem for the Unimog. Its impressive climbing ability – even when fully laden – is due to the high torque of the engine, the optimum gear ratios and the excellent traction ensured by four-wheel drive and differential locks in both axles. Even where rivers or flooding create seemingly impassable barriers, the Unimog can generally find a way through. With its “long legs”, a fording depth of 80 cm is no problem, and a depth of 120 cm is possible as an optional extra. The internal pressure within the major components stops water from penetrating them. One of the factors that contributes to the Unimog’s excellent off-road mobility is its compactness. This allows it to get through very narrow and low gaps where other vehicles have to give up. A short wheelbase, a favorable track width and a large steering angle result in a turning circle which is small for a vehicle of this type. The Unimog’s ease of handling is further enhanced by power steering. For fast on-road driving and in normal weather conditions the Unimog’s engine power is only transmitted to the rear wheels. This means fewer gear wheels are used, and the tires are subjected to less wear. When the Unimog leaves ordinary roads, or when ice and snow are on the ground, other rules apply. In most such cases, four-wheel drive is the right answer. And here the Unimog is totally uncompromising. Front-wheel drive is engaged pneumatically via the dog-type clutch while on the move, without any interruption to tractive force. The heart of every Unimog is a Mercedes-Benz diesel that has proved itself thousands of time over. Despite varying features, such as having four, five or six in-line cylinders, or outputs ranging from 90 kW (122 hp) in the U100LTurbo to 177 kW (240 hp) in the U 2450 L 6X6. All the direct-injection Mercedes-Benz diesel engines have quality-related characteristics in common. A long service life, high tractive power over a wide speed range, an impressive degree of smoothness, and environmental acceptability due to low noise levels, fuel economy and favorable emission levels. To ensure that the engine is properly supplied with oil even on steep inclines or when tilted heavily to one side, the Unimog’s sump has been made larger. These are all aspects that only an experienced engine manufacturer can incorporate, a manufacturer that develops engines with an eye to the future and has already built millions of diesel engines. The hydraulically operated, pneumatically assisted dual-circuit disc brakes which are fitted as standard always bring the Unimog safely and quickly to a halt, even during faster driving and with heavy loads. The brake discs are large and self-cleaning. The brake pads are asbestos-free. Additional safety is provided by the standard automatic load-sensitive rear brakes, which vary the braking force in accordance with the load. The medium and heavy-duty models, the U 140 L to U 2450 L, can be fitted with an exhaust brake as an optional extra. This assists and reduces the strain on the service brakes on long, steep downhill stretches. The light and medium-heavy Unimog series. More flexible than every before – the all-synchromesh Mercedes-Benz 8 speed gearbox, with 8 forward and 4 reverse gears. Even the practically graduated basic unit covers the entire speed range. Then there are 8 optionally available intermediate gears. These have a new pneumatic system which allows them to be shifted particularly smoothly. Exterior synchromesh and helical gearing, together with automatic gear-shifting when the clutch pedal is operated )following appropriate preselection) go to make up an advanced transmission system which his especially easy to use and which, with a total of 16 speeds, meet the most demanding of operational requirements. The right speed for any application. 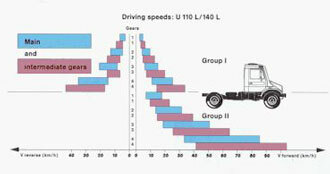 The finely graduated gearbox of the Unimog permits speeds from a walking pace all the way up to over 100 km/h. In models U 1450 L to U 2450 L the main gearbox has 8 gears. With the addition of the working gears, 16 fully-synchromesh gears become available, both forward and reverse. The double-H gate makes shifting precise and easy. A shift gate display tells the driver which gear is engaged, making operation even more convenient. PTOs can use full engine power to drive implements. The transmission PTO is a cost-effective feature, since the gearbox clutch and the PTO clutch are identical. Possible uses include the powering of winches, compressors and generators. An additional, fast-running PTO is also available, for instance for driving the hydraulic pump of a loading crane, or for fire-fighting pumps or generators. Mercedes-Benz supplies an efficient hydraulic system ex factory. Pump output ranges from 40 to 55 litres/minute at an operating pressure of 180-200 bar. Up to 4 double-acting control valves permit a a total of 8 hydraulic connections at the front and 4 at the rear, each with a separate return line. With the new four-way lever, the simultaneous operation of various implements such as winches and hydraulic equipment is now even more convenient. Durable all round, however hard the work. Support assemblies for drop-sider and box bodies or a very wide variety of working implements can be mounted at predetermined points which are optimally located to take into account torsion and center of gravity. Simply, quickly and safely. Any thrust or tensile forces are conducted through the special mounting points in the frame. Even with heavy implements and box bodies, a Unimog’s cross-country capability is maintained to the full. The cab, the engine, the gearbox and the platform or floor unit are located at three points. This ensures impeded torsional flexing of the Unimog’s frame even when it is fitted with special bodies and equipment, so off-road capability is not restricted. The resultant low mechanical stressing enhances the service life even of the light-weight box bodies used today. For hard-working drivers, comfortable, ergonomically designed seating is essential. That’s why the Unimog has three-point cab mounting and a multiply-adjustable, hydraulically cushioned (optionally air-cushioned) seat. The roomy cab provides plenty of space for two co-drivers. Three-point seatbelts can be fitted. As a result of the new steering wheel position the Unimog offers more leg room, convenient entry and easy through-cab access. The optimized position of the steering column tube and the new steering column lining provide great improved protection for the knees in the event of an accident. The efficient heating and ventilation system, equipped with a circulating pump, ensures a pleasant and stable interior climate at all times. Additional air can be supplied by means of a roof vent, the crank-operated side windows and the optionally available sliding windows in the rear of the cab. Air-conditioning and an improved, environment-friendly auxiliary heater are also available. The controls are so conveniently located that the driver can use them without transferring his attention from the road or the job in hand. He also has a clear overview of the standardized symbols, illuminated switch clusters and speedometer. The control instruments are situated within close range. Working is further facilitated by the excellent view of the implements. The new, more powerful 24 V halogen headlamps have a broader illumination range. Additional beams provide more light when working with front-mounted implements; rotating beacons can be mounted easily behind the cab. The Unimog can be supplied with right-hand drive and with a crewcab for up to seven persons. Click Here to go back to the Tech Page.